I’ll give you some highlights of a couple sessions that interested me. 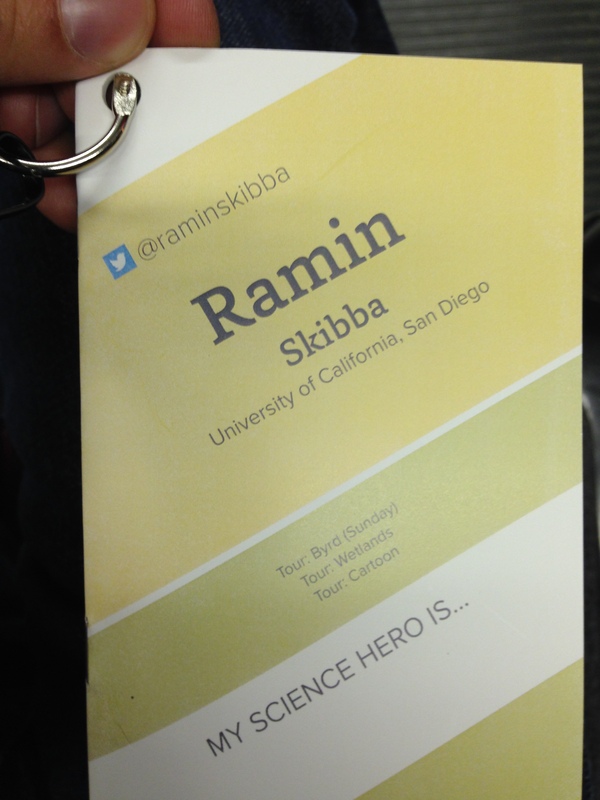 People “live-tweeted” most of the sessions too at #sciwri14. One of the most useful sessions for me was the “pitch slam,” where writers had a single minute to pitch a story idea to editors, who gave feedback in real time. (The editors came from Slate, NPR, Popular Science, Discover, NOVA, Scientific American, and New York Times.) Speaking in front of the microphone understandably made people nervous, but I think I heard some pretty good pitches. Since I’m trained as a scientist, my approach to a science story or issue is to keep asking questions, but it sounds like editors want answers too! It’s important to be concise and clearly state at the beginning what the narrative thrust is and why the story is interesting. One should also describe the implications of the scientific result are why they’re surprising or new. Science stories need characters too, but that can come afterward. And one should keep in mind the audience of readers who would most likely read it, since some stories are more appropriate in particular news outlets rather than others. For example, Popular Science usually publishes “forward-looking” stories, so they’d be less interested in pieces focused on historical scientific advances. The session on “diving into controversy and politics” was popular too, and it included Coral Davenport (New York Times), David Malakoff (Science Insider), and Nancy Shute (NPR). They spoke about hot-button topics in the news today—mainly climate change and Ebola. Davenport argued that climate change (along with energy and environment policy) is now a top-tier election issue and that this is mainly due to President Obama’s Environmental Protection Agency (EPA) regulations for coal-fired power plants, Tom Steyer’s money, and current weather events. She made a fairly convincing argument, but I think she overstated how new this development is, as fracking and the Keystone XL pipeline have been polarizing issues well before this midterm election campaign. Malakoff spoke about related topics and suggested that one should never pitch a “science policy” story (that is, one should frame the story differently). He pointed out that some stories are about a disagreement while others are about setting priorities. It’s important to state as clearly as possible who believes what and what their agenda is. We should ask whether the data and scientific results lead us to a particular policy prescription, and we should distinguish between scientists’ research and their opinions about which policy to advocate. We should write about the effects and impacts of particular policies, and then the reader can make his/her own decision. The awards night took place on Saturday, and I was inspired to see so many excellent award-winning science writers. The winners included Azeen Ghorayshi for the Clark/Payne Award, Elisabeth Rosenthal for the Cohn Prize in medical science reporting, and the following Science in Society Journalism Award winners: Sheri Fink, Amy Harmon, Phil McKenna, Cally Carswell, and Charles Seife. Getting back to climate change, on Sunday we toured the impressive Byrd Polar Research Center of Ohio State University. 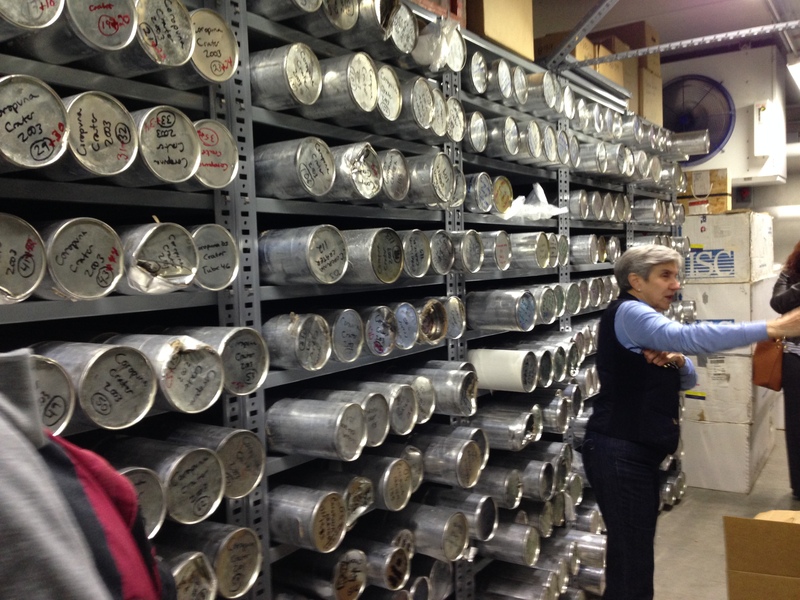 Lonnie Thompson and Ellen Mosley-Thompson, who have published numerous influential papers in Science and Nature, showed us the center and explained their research to us, which involves many fields but especially ice core climatology. Since the 1970s, they have conducted research at the poles as well as on mountains near the equator (in Peru and Tibet), where they drill down and pull up the ice cores, then bring them down the mountain on yaks and trucks and eventually store them in a huge freezer, which you can see below. (Our brief tour of the freezer was the only time I wore my hat on this trip.) Drs. Thompson and Mosley-Thompson use the ice cores to infer details about the climate and history of a particular regionTEXTsort of like using tree rings. For example, from ice cores taken from Kilimanjaro, they found evidence of a 300-year drought 4000 years ago (evidenced by less snow and ice accumulation), which would have had a dramatic effect on societies at the time. With rapid climate change, unfortunately the glaciers are rapidly retreating, but a silver lining is that they’ve uncovered 5000 to 6000-year-old plants! Finally, I had looked forward to the discussions of the ongoing BICEP2 controversy, and I was not disappointed. Marc Kamionkowski (Johns Hopkins University) gave an excellent overview of the basics of cosmology, the expanding universe, cosmic microwave background radiation (CMB), which is sort of an “afterglow of the Big Bang.” Many collaborations using different telescopes (including researchers at UC San Diego) seek to detect CMB “B-mode” polarization of the CMB due to primordial gravitational waves, which would constitute evidence supporting the rapid “inflation” of the early universe and would be a momentous discovery! At the BICEP2’s press conference in March at Harvard and in the preprint, the scientists did say “if confirmed…”, but of course everyone was excited about the implications of the result. 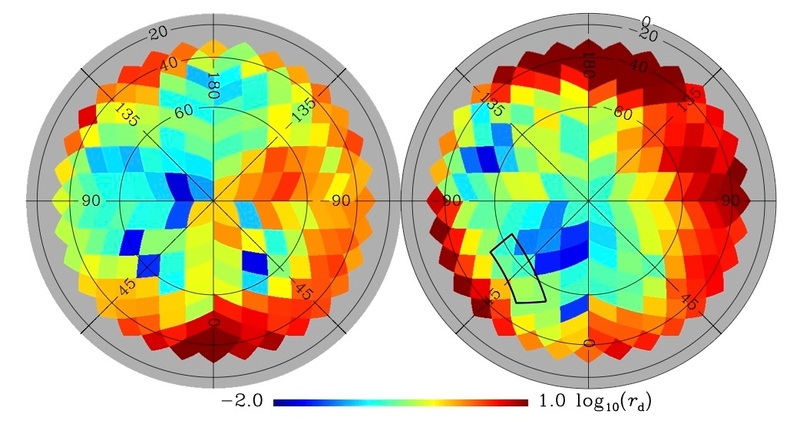 However, new measurements from the Planck collaboration (see below) suggest that the polarization might not be due to the CMB’s gravitational waves but to foreground emission from dust grains in our own galaxy, though their calculation of the dust contribution is highly uncertain. A short discussion with Matthew Francis (freelance) and Betsy Mason (Wired) followed Kamionkowski’s talk, where they tackled questions that scientists and science communicators frequently face. Scientists want press attention and news outlets want headlines, so how should one describe and report caveats and uncertainties, especially when the implications (if confirmed) are so exciting? What is the best way to express skepticism of a particular aspect of a scientific result? And a question that I often ask: how can we communicate the messiness or “self-correcting” nature of science? In any case, we’ll all continue to follow the ongoing CMB debate in the scientific community and the media. Now I’m looking forward to doing much more writing (and reading) and to participating in next year’s meeting!